GRC's spring season continues in full swing, with track and road races keeping this blogger busy throughout the weekend. This evening marks the fourth of five Pacers Crystal City 5ks. LTO will return to the 5k racing action and without a toddler in a stroller slowing her down, look for LTO to turn in a strong performance. Runpacers.com cover girl Susan will run her first race of 2016 before maybe, actually leaving us for Hoboken. With these two ladies pushing the pace, there's a strong chance GRC can return to the top of the women's podium after being dethroned last week. Four GRC athletes will race the 1500 within one hour of each other at three different meets. Fresh off her 1500 PR last week, Kara will take on the competition at the Morgan State Legacy Meet in Baltimore at 11:15am (live results here). At 12:05pm, Luk and Kyle will race at the Widener Invitational, both men taking a stab at the shorter distance after solid 5ks last week. At the Princeton Larry Ellis Invitational, Liz will race the 1500 for the second weekend in a row. Liz's race is scheduled for 12:30 pm and live video is available online for FloTrack Pro subscribers. Pat K will be the sole GRC runner at the Pike's Peek 10k in Montgomery County. Last year, Pat was the top masters runner at the event, which is known for its fast, downhill course. 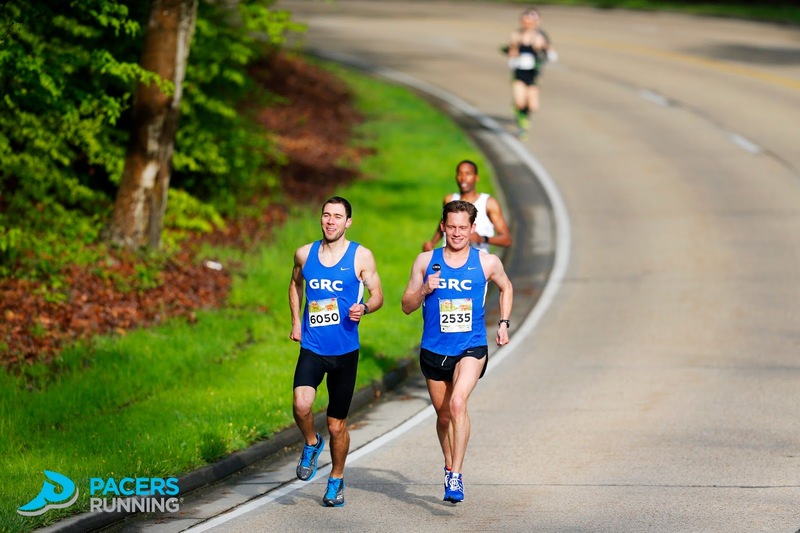 On Sunday morning, a hearty crew of GRC runners will trek out to Mt. Vernon to run 10 miles back to Alexandria in the GW Parkway Classic, and maybe have some laughs along the way. Laughs along the way. Photo by Swim Bike Run Photography. Carlos is riding a streak of sharp race performances and will look to build on that momentum. Outlaw is in excellent shape and may notch a PR as he cruises into Old Town. Sam, Charlie, and Evan will use the Parkway Classic to supplement the hard training they've been doing in preparation for Grandma's Marathon. Breezy and Dave O round out the deep men's squad. The women will be represented by Kerry and MGP. Kerry will use the race as a final tune-up before Broad Street next week, and MGP will tackle the 10 miler to kick off her training for a late June marathon debut.